***Insurance has approved a new roof! *** If you are looking for a move in ready home this one is it! This Banyan built home is nestled in the community of Eastridge with views of the landmark Citrus Tower from your backyard. A split floor plan with the master on one side and 2 bedrooms and guest bath on the other makes this the ideal family home. Upon entering the home you will notice the cathedral ceilings and ceramic tile floors in all rooms except the bedrooms. You can enjoy eating or entertaining and looking out onto the back screened in patio area. The kitchen boasts all wood cabinets and stone counter tops with a closet pantry for storage. The master bedroom has two large walk in closets for ample storage. The second and third bedrooms have plenty of space. The indoor laundry room is large with cabinet storage above the washer and dryer that stays with the home! You also have a two car garage with cabinets, so plenty of storage space and an attic with space. All appliances stay with the home. This home is move in ready! HVAC was replaced in 2012, Double pane windows and sliding back doors, New garage door 2016 with remote access. Home square footage and room dimensions should be independently verified. 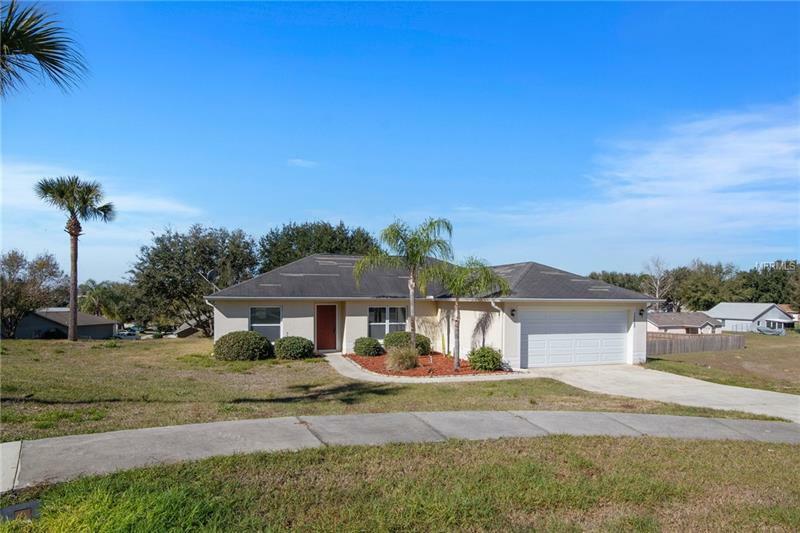 Just minutes from the new FL Turnpike ramp, highly sought after public schools, shopping, restaurants, Lake-Sumter Community College, South Lake Hospital, Theme Parks and the Orlando Airport, this home has it all! Make this your dream home!